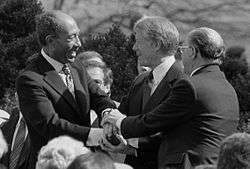 Anwar Sadat, Jimmy Carter and Menachem Begin at the White House, 1979. The Egypt–Israel Peace Treaty (Arabic: معاهدة السلام المصرية الإسرائيلية‎‎, Mu`āhadat as-Salām al-Misrīyah al-'Isrā'īlīyah; Hebrew: הסכם השלום בין ישראל למצרים‎‎, Heskem HaShalom Bein Yisrael LeMitzrayim) was signed in Washington, D.C., United States on 26 March 1979, following the 1978 Camp David Accords. 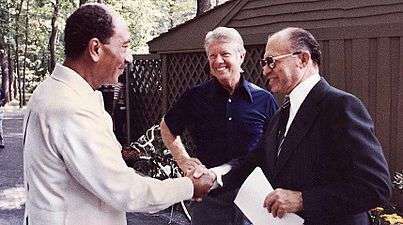 The Egypt–Israel treaty was signed by Egyptian president Anwar Sadat and Israeli prime minister Menachem Begin, and witnessed by United States president Jimmy Carter. The peace treaty between Egypt and Israel was signed 16 months after Egyptian president Anwar Sadat's visit to Israel in 1977 after intense negotiation. The main features of the treaty were mutual recognition, cessation of the state of war that had existed since the 1948 Arab–Israeli War, normalization of relations and the complete withdrawal by Israel of its armed forces and civilians from the Sinai Peninsula which Israel had captured during the Six-Day War in 1967. Egypt agreed to leave the area demilitarized. The agreement also provided for the free passage of Israeli ships through the Suez Canal, and recognition of the Strait of Tiran and the Gulf of Aqaba as international waterways. The normalization of relations between Israel and Egypt went into effect in January 1980. Ambassadors were exchanged in February. The boycott laws were repealed by Egypt's parliament the same month, and some trade began to develop, albeit less than Israel had hoped for. In March 1980 regular airline flights were inaugurated. Egypt also began supplying Israel with crude oil. On 18 May 1981, the President of the UN Security Council indicated that the United Nations would be unable to provide an observation force, due to the threat of a veto of the motion by the Soviet Union. As a result of the impasse, Egypt, Israel and the United States opened negotiations to set up a peacekeeping organization outside the framework of the UN. On 3 August 1981, the Protocol to the Treaty of Peace was signed, establishing the Multinational Force and Observers (MFO). This observation force monitors both parties to ensure compliance with the treaty. The peace treaty includes a stipulation, called the Agreed Activities Mechanism, that allows Egypt and Israel to jointly alter the arrangements of Egyptian troops in the Sinai without having to officially review the treaty itself. Israel has allowed Egypt to deploy forces to central and eastern Sinai out of mutual security concerns, such as the presence of jihadi militant groups in these areas. These alterations are coordinated through the MFO. In January 2011, during widespread protests by Egyptians against their government, Israel agreed to allow Egypt to move several hundred troops into the Sinai Peninsula for the first time since the peace treaty was signed. With Israel's agreement, Egypt moved two battalions, about 800 soldiers, into the Sharm el-Sheikh area on Sinai's southern tip, far from Israel. In August 2012, Israel agreed that Egypt could deploy additional forces, including attack helicopters, in the northern Sinai to combat militants who had carried out an attack on Egyptian border guards that left 16 dead. Later that month, Egypt moved additional heavy weaponry into the demilitarized zone without Israeli approval, in violation of the peace treaty terms. Egypt said that the deployment of these troops and weapons was in keeping with agreements reached with Israel in 2011. Israel reportedly asked the United States to mediate this dispute. Shortly thereafter, Egyptian defense minister Abdel Fattah el-Sisi reportedly assured his Israeli counterpart, Ehud Barak, that Egypt was committed to maintaining the 1979 Camp David peace treaty with Israel. In July 2013, after a number of violent incidents in the Sinai Peninsula, Israel agreed to the deployment of additional Egyptian troops. This treaty was received with enormous controversy across the Arab world, where it was condemned and considered a stab in the back. The sense of outrage was particularly strong amongst Palestinians, with the leader of the Palestine Liberation Organization, Yasser Arafat, stating: "Let them sign what they like. False peace will not last". On the other hand, the treaty led both Egyptian president Anwar Sadat and Israeli prime minister Menachem Begin to share the 1978 Nobel Peace Prize for bringing peace between the two states. However, as a result of the treaty, Egypt was suspended from the Arab League in 1979–1989, and Sadat was assassinated on 6 October 1981 by members of the Egyptian Islamic Jihad. The peace between Egypt and Israel has lasted since the treaty went into effect, and Egypt has become an important strategic partner of Israel. Binyamin Ben-Eliezer, a former Israeli defense minister known for his close ties to Egyptian officials, has stated that "Egypt is not only our closest friend in the region, the co-operation between us goes beyond the strategic." As part of the agreement, the U.S. began economic and military aid to Egypt, and political backing for its subsequent governments. From the Camp David peace accords in 1978 until 2000, the United States has subsidized Egypt's armed forces with over $38 billion worth of aid. Egypt receives about $1.3 billion annually. Nevertheless, the peace is often described as a "cold peace", with many in Egypt skeptical about its effectiveness. The Arab-Israeli conflict has kept relations cool. In 2008, the Egyptian army conducted simulated military exercises against an "enemy" Israel. The Egyptian Revolution of 2011 led to fears in Israel about the future of the treaty, although the Israeli prime minister Benjamin Netanyahu stated that he expected any new Egyptian government to keep the peace treaty with Israel, as it has served both countries well. After the Egyptian Army took power on 11 February 2011, it announced that Egypt would continue to abide by all its international and regional treaties. However, Ayman Nour, an influential Egyptian opposition figure and likely presidential candidate called for Cairo’s peace treaty with Israel to be "reassessed". On 15 September 2011, the then Egyptian prime minister Essam Sharaf said that "A peace deal with Israel was not sacred". Rashad al-Bayumi, the deputy chief of Egypt's largest party, the Muslim Brotherhood, said that they would not recognize Israel and that the treaty could be put to a referendum, emphasizing that while they respected all of their international agreements, they "had the right to review the peace deal" and that the Egyptian people "have yet to speak their mind". Representatives of the group had told U.S. diplomats that they did not intend to revoke the treaty. Addressing Israeli concerns on July 31, 2014, Egyptian president Abdel Fattah el-Sisi pledged to continue the peace with Israel. ↑ 10 Tactical Air Group: Canadian Contingent Multinational Force and Observers Handbook (unclassified), page A-1. DND, Ottawa, 1986. ↑ Ehud Yaari (17 January 2014). "The New Triangle of Egypt, Israel, and Hamas". Washington Institute for Near East Policy. Retrieved 23 January 2014. 1 2 "Israel allows Egypt troops in Sinai for first time since 1979 peace treaty". Haaretz. Associated Press. ↑ Keinon, Herb (9 August 2012). "Israel OKs Egypt attack helicopters in Sinai". Jerusalem Post. 1 2 Issacharoff, Avi (16 August 2012). "Egypt deployed troops in Sinai without Israel's prior approval". Haaretz. Retrieved 24 August 2012. 1 2 3 Keinon, Herb (21 August 2012). "Int'l force in Sinai quiet amid concern of violations". Jerusalem Post. Retrieved 29 October 2013. ↑ "'Egypt affirms commitment to Israel peace treaty'". The Jerusalem Post. 24 August 2012. Retrieved 24 August 2012. ↑ "Israel approves Egypt's request to increase forces in Sinai". Jerusalem Post. 15 July 2013. 1 2 Kershner, Isabel (27 January 2011). "Israeli concern for peace partner". Sydney Morning Herald. Retrieved 31 January 2011. ↑ "Egypt". State. 22 August 2012. Retrieved 13 March 2013. ↑ "Egyptians ponder 30-year peace with Israel". BBC News. 26 March 2009. ↑ Amira Howeidy (2002). "Protocols, politics and Palestine". Al Ahram. Retrieved 27 March 2011. ↑ Black, Ian (31 January 2011). "Egypt protests: Israel fears unrest may threaten peace treaty". The Guardian. London. ↑ "Netanyahu: Egypt Could Be A New Iran". Fox News. 8 February 2011. ↑ Fahim, Kareem (12 February 2011). "Egypt Sees New Era After Exit of Hosni Mubarak". The New York Times. ↑ "Egypt PM says peace deal with Israel not sacred". Reuters. 15 September 2011. ↑ Khoury, Jack (1 January 2012). "Egypt's Muslim Brotherhood: Fate of Israel peace treaty may be decided in referendum". Haaretz. Retrieved 13 March 2013. ↑ "Al-Sisi: Egypt is committed to peace with Israel". Ynet News. Retrieved 31 July 2014.